Unfurnished annual rental with SE Ocean and ICW views. Renovated 2 bedroom 2 bath. Marble foyer, living room & kitchen. Bedrooms carpeted. All Impact Glass windows and doors. 1 Garage parking space. No smoking in condo including ecigarettes. Tenant required to have renters insurance. No storage unit with rental. Photos on listing were taken when condo was furnished/occupied. Condo is now unfurnished. Directions: Palmetto Park Road East Over The Icw. 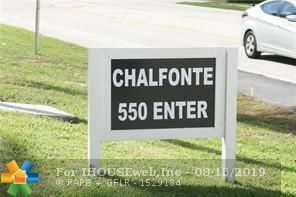 Make Right On A1a To Chalfonte #550 On Left. Park In Garage Guest Parking.